Here's some basic lessons from Introduction to Hippie Wear 101. First: bell bottoms will increase your ability to play hacky sack by making your foot look bigger. Second: a good headband will keep your hair out of your eyes while you play hacky sack. Third: fringe inexplicably makes hacky sack better. A: help you look scruffy. B: be very comfortable for campfires, camping, or just hanging out in vans. C: they will make you look like one cool cat. As you can see from our lesson above, Hippie wear has a lot of benefits, including but not limited to: enhancing hacky sack. experiences and making you look far out. So, if you are ready for these excellent clothing features, we would like to offer you access to our Plus Right On Hippie Costume. This choice outfit includes a long-sleeved, white, v-neck shirt with a suede vest attached. 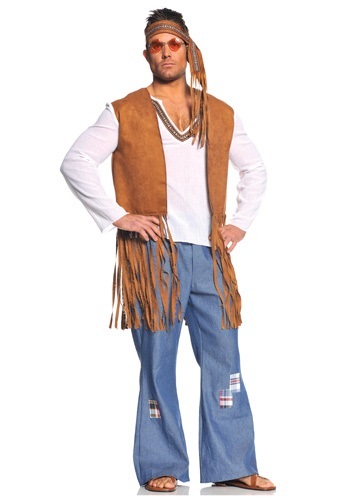 There's also blue pants with sewn-on patches, a headband, and copious amounts of fringe. Footwear is optional. You get all that? Alright then. Grab some circular shades and prepare for the pop quiz.